Building on the shoulders of basketball history in last year's edition, NBA 2K12 will let you pit modern stars against Hall of Famers. Basketball is a passion for me. If I was a little bit taller - ok, a lot bit taller - and had a better natural shot, I would have loved nothing more than to play basketball for a living. I still follow the NBA and my college team won the National Championship for the third time last year (U-C-O-N-N! ), and I've read Bill Simmons' Book of Basketball over the last year or so while sitting on the porcelain throne. Given my love of the game, I was impressed last year with NBA 2K11's attention to basketball's historical details like mostly accurate rosters and arenas from some of Michael Jordan's greatest moments. The only thing I lamented was that I had to suffer through those moments as Jordan instead of personal heroes like Larry Bird or Ray Allen. It seems 2K Sports read my review, or maybe they have a chip in my brain, but with 2K12 I'll be able to play as #33. I can't wait to pit him not only against the Showtime Lakers but also contemporary powerhouses like LeBron James and Kevin Garnett with the NBA Greatest mode. "The NBA 2K franchise has become an essential part of the NBA culture, and our fans can now take control of legendary teams and athletes from the NBA's rich history," said a marketer from 2K Sports. "With 'NBA's Greatest' mode, NBA 2K12 will allow fans to prove once and for all who are the greatest basketball icons of all time." For those of you keeping track at home, that's four out of the top five of players in the history of the NBA, at least according to Simmons, with Dr. J thrown in for good measure. Now all we need is Bill Russell and Wilt Chamberlain in the game so I can pit them one and one and finally end that endless debate. 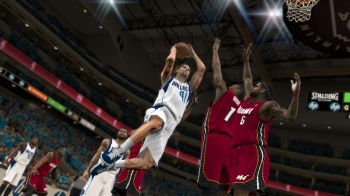 NBA 2K12 is slated to tip off on October 4th for the PS3, PS2, PSP, PC and Xbox 360.